As in much of the deep south of Italy, the rural landscape of Campania is beautiful and timeless, with ancient olive trees set behind white-stone walls, groves of oranges and lemons and, of course, vines. Fuedi di san Gregorio is one of the largest and most famous wine producers of the region, specifically of Irpinia, the historical inland sub-region around the town of Avellino, 50 kilometres east of Naples. 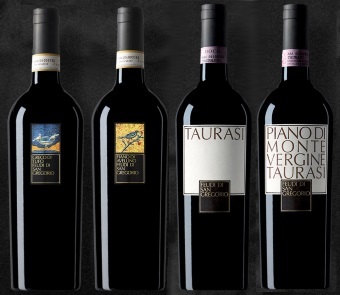 Fuedi di san Gregorio focuses on the three major grapes of the region, Aglianico for red wines and Fiano and Greco for white wines, and the three synonymous DOCG regions, Taurasi, Fiano di Avellino and Greco di Tufo. The estate was founded in 1986 by two local families who, from the outset, referenced their vineyards and wines through art, the winery designed by renowned Japanese architect Hikaru Mori, interiors and even the Feudi’s logo and labels the work of Massimo and Lella Vignelli, husband and wife design team whose work included everything from the modernist New York Subway map, to Bloomingdale’s shopping bags. Today around 3.5 million bottles are produced annually, from Fuedi di san Gregorio’s 600 hectares of vineyard and local growers. A third white grape, Falanghina, is also grown and bottled as a varietal wine, and there are other minor varieties, again all indigenous to the area, including Coda di Volpe and Biancolella. It appears to be an absolutely meticullous operation, their vineyards mapped into almost 800 distinct parcels, their super-modern winery bristling with state of the art technology. Wines are bottled under ‘DIAM’, taint-free, techincal corks. I’ve been a fan of Feudi di san Gregorio’s whites for years, the first tasting notes in my database dating from 2002. The limpid, textured but super-fresh character of those is still hugely appealing, but it was eye-opening to be introduced to two of their red Aglianico wines from Taurasi: the approachable but impeccably-made Taurasi 2013, and the profound single-vineyard cuvée, Piano di Montevergine 2012. It is a wine-making operation with quality stamped all over it. Great to see you reviewing this old face, and good to see they seem to be bang on form! Yes, always loved the whites as I say in the article, and those early tastings of their Fiano and Falanghina almost 20 years ago opened my eyes to the quality whites of Campania.